April is Michael Penn Appreciation Month. Didn't know that, eh? It's true! Michael has two releases due this Tuesday, and I'm looking forward to getting my hands on both of them. 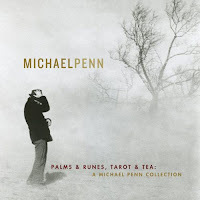 First up is Palms & Runes, Tarot & Tea: A Michael Penn Collection. If you don't have any of MP's music, this would be a great primer for you to become acquainted with music from his first four releases. If you already a Penn fan, you'll want this disc, too, which features some alternative versions of songs along with previously unreleased material. Michael's fifth CD, Mr. Hollywood Jr. 1947 is also being re-released on Tuesday, remastered, and with a bonus disc of live music. Can't beat that with a stick, eh? 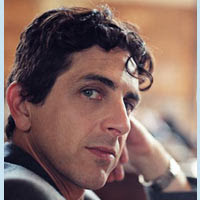 My regular 4.5 readers here know just how much I dig the music of Michael Penn. There are few singer-songwriters out there that really grab me and swing me around with their words and music - MP is one of those rare creatures. This weekend, I've been listening to all his stuff, just jumping around, track to track, on iTunes. Can't find a song I don't enjoy in the whole mix. We were seated next to two folks from the PennList - a married couple who seemed very cool and whose posts I enjoy reading. (I was glad to meet someone else who'd witnessed Elvis Costello's "Spinning Songbook" tour!) I think they were pretty darn pleased with the vantage point, too. Right behind us was the extremely nice guy who runs the PennList and does a lot of work on Michael's behalf. He was the best-dressed man in the room and it was really great to finally put a face to the name and the Internet "voice." We really didn't know each other beyond the Penn List at that point. Our conversations were limited to things like, "Nice camera!" and "I just won a free iTunes download with my diet Pepsi cap!" and "Uh, are you Spencer?" Can't believe it's been two years. Amazing. It really will be great to see them again. It's funny. I've met most of my friends because of a shared interest in a particular musician. Some via the Thomas Dolby connection. Some via the Michael Penn connection. Man, I owe these guys a lot. Even more reason to buy Michael's new stuff this week. You should go buy them, too. You won't be disappointed. While I can't guarantee you'll meet cool new friends as a result of the purchase, you never know, eh? Can you explain the 1/2-regular reader of your 4.5? OK, now I want to know about the Ax Incident. I almost got fired from my last job...but it turned out well, because when I gave my notice they paid me my last two weeks salary without me having to work them. I just wrote about it on my blog if you're interested. However, now that you know us (the married couple from Philadelphia, for the uninitiated) better, you realize that we only seemed cool. It's an illusion we have to work on constantly to maintain. Well, maybe my spouse is actually cool. I'll just cop to being goofy, hopefully in a semi-endearing way.